This video uncovers the secrets to making you a great chipper. 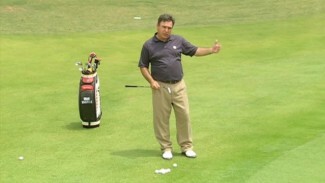 PGA Professional Mike Bender shows you how to hit chips with different trajectories: low, medium, high and flop. He demonstrates what to do with your wrists, arms, elbows, shaft angle, club head and follow-through to ensure you hit consistently good chips. You will learn the mistakes amateurs make with their chipping and discover chipping drills to improve your short game.